Up until now, the time spent in the cabin of your Beechjet 400A or Hawker 400XP was time spent “out of touch” with the world below. Your business… your family… your life was on hold until the wheels touched the ground again. You made a choice to use business aviation for travel because of its flexibility and efficiency and for the fact that your time in flight could be used for remaining productive with your work. But as business around the world becomes more and more dependent on real-time communication and access to the Internet, that time spent “offline” in the cabin of your Beechjet is hurting rather than helping your productivity. That’s all changed. Cutter Aviation is proud to present High-Speed Wireless Internet solutions for your Beechjet 400A & Hawker 400XP with packages from Aircell, the leader in airborne communications for business aviation. Now you can have the entire Internet at your disposal from takeoff to landing and remain in contact with your world when every second counts. Answer email, review files downloaded from the Cloud, catch up on research and explore new opportunities from your fully-connected office at 40,000 feet. Inflight and online. You may have looked at in-flight communications in the past and dismissed it because of the sky-high costs involved. Those days are behind us and the in-flight communication revolution is here! Gone are the half-million-dollar price tags. Gone are the weight penalties for the heavy equipment previously required. And gone are the broadband speeds that clocked in slower than an archaic dial-up connection. 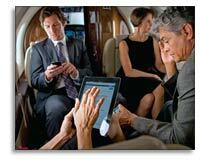 With the revolutionary systems for your Beechjet 400A or Hawker 400XP from Cutter Aviation and Aircell, you can enjoy Internet access in the air just like you’d find at home, office, or your favorite coffee shop. Your own laptops, tablets and smart phones connect with ease to the new compact equipment and antennas required on a light jet like the Beechjet. Best of all, it’s more affordable than ever. What Can You Expect with Airborne Wi-Fi? Same connection experience and service as found on the ground. Reliability & security of a typical ground-based high-speed Internet connection. Wirelessly use your own laptop, smart phone, iPad / tablet, or Internet-enabled MP3 player. Connection speeds up to 3.1 Megabits per second (Mbps). Various monthly data plans available through Gogo Biz from basic access up to Unlimited data. With more than 10,000 systems shipped worldwide, Aircell is the undisputed leader in global airborne communications. Already flying on thousands of aircraft, Aircell’s voice, data and broadband systems are the choice of every major business aircraft manufacturer as well as the world’s largest airlines. Founded in 1928 and continually family-owned and operated since, Cutter Aviation is a leader in the business aviation industry and a well-respected name for aircraft avionics and maintenance support. Beechjet owners and operators have trusted Cutter Aviation for maintenance and avionics service for years.